With the Majors now done and dusted, top SEA seed PIFO and 2nd-placed Lupin are about to ascend to the final stage in the League – the Masters. Could one of these 2 Korean teams be our next APAC champion? We checked in with both of them ahead of the start of the competition, and here’s what they had to say. 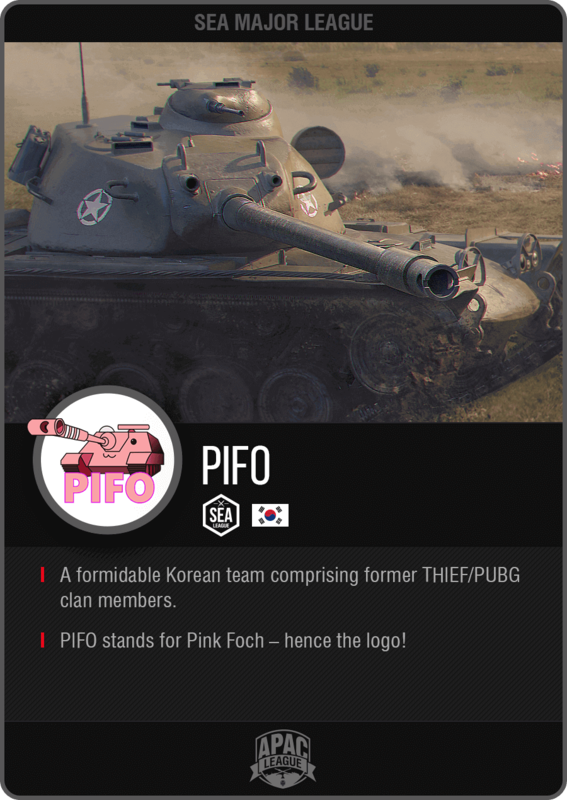 Chrissy (team captain): I created the team 2 years ago when I was PIFO clan commander on the KR server. Yaltank [a famous Korean WoT streamer] recommended that I join the Wargaming.net League. How does your team usually prepare for each match? We practice twice a week, but actually, in Week 1 we didn't practice at all! [laugh] Of course, we try to train together, but sometimes people are busy and they cannot all join. What kinds of strategies do you expect from the teams in the other Major Leagues? We train with many teams from other regions, like Team Efficiency, Naughty Kids, Typhoon, Penguin, and Caren Tiger, so I’m not really sure what to expect! [laugh] Every team has its style – CT is good with heavy tanks; TYP brings many Object 268v4s. Are there any maps you would want to see included in future APAC League Seasons? I want Ghost Town, I love it! We practised Ghost Town so many times, and our clan performed well on Ghost Town during Clan Wars. How does it feel to have come this far in the APAC League? At the beginning of the League, we weren’t that committed (as I said, we didn’t train during Week 1). But then we felt like we had a chance so we started training. Our goal was to reach the top 3. What made you decide to start playing competitively? 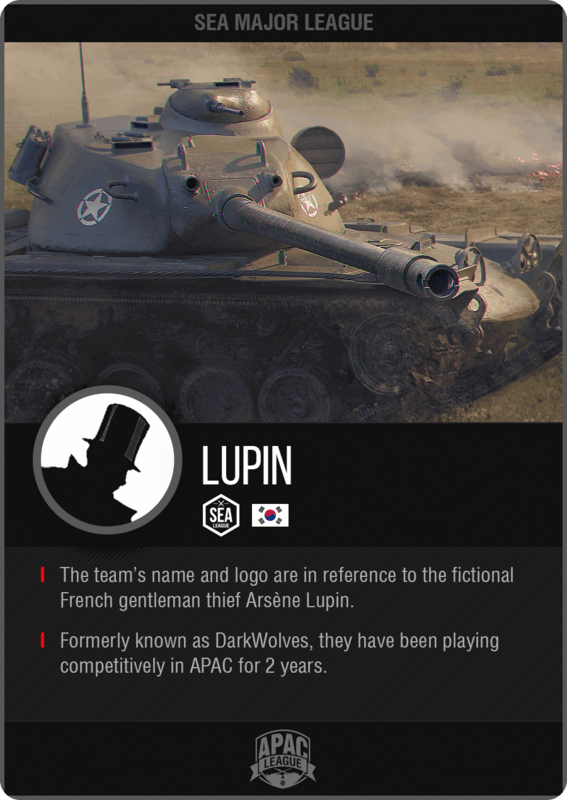 Revolution (team captain): We have participated in the Wargaming.net League APAC since 2015, but we've actually changed our name 3 times. Maybe you know us as Dark Wolves. We joined this League to gain some competitive experience. Winning games made us happy, and that's the main reason. Of course, money prize is important, but I generally feel good when I play games in official leagues. What challenges have you faced as a team so far? There were some stressful moments when teammates argued against each other. Sometimes the team was almost divided. But both my teammates and I tried to understand each other; we aimed for a good ranking and practised over and over for it. Through our efforts, we can be united. Which team do you consider your strongest opponent in this tournament? There are no weak teams in this League. We always have to do our best to win. If I had to pick one team, I would say Team Efficiency is the strongest team currently. It’s hard to do what we want when playing against them. Are there any particular lineups you're expecting other Major League teams to bring out? I expect to see some SPGs from other teams! If you look at our old 2015 games we often played them, but our veteran SPG player has retired, so we don’t use them anymore. Which maps would you want to see added to the APAC League rotation? I really want to play Steppes. I know that the boost has been a problem; I hope it gets fixed so we can play that map again.